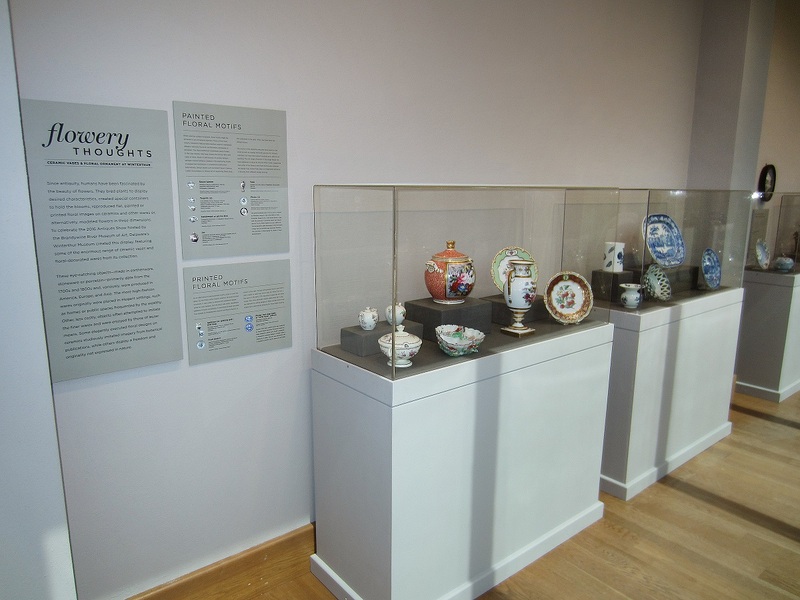 A glimpse of Flowery Thoughts: Ceramic Vases & Floral Ornament at Winterthur, on view at the Brandywine River Museum of Art May 28 through September 5, 2016.. 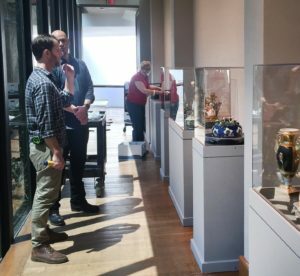 The exhibition Flowery Thoughts: Ceramic Vases & Floral Ornament at Winterthur is another in a series of loan exhibitions created by Winterthur Museum for its neighbor, the Brandywine River Museum of Art. This year’s exhibition will be unveiled at the BRMA’s 45th annual Brandywine Antiques Show (May 28–30) and will remain in the museum’s galleries through September 5. Thomas Padon, director of the BRMA, first discussed a possible show with me back in December, and we almost immediately decided that a springtime theme was just the thing. 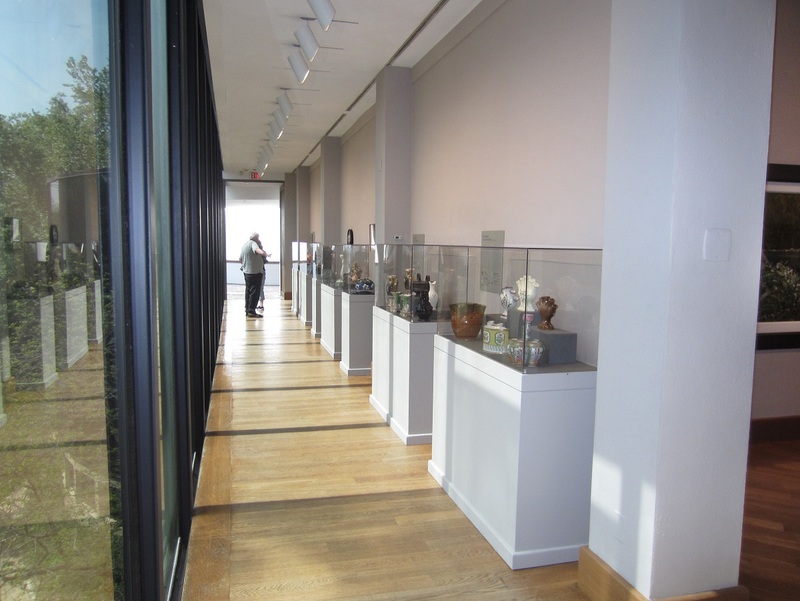 The topic also was appropriate since the gallery we chose overlooks a beautiful, natural setting along the Brandywine River. 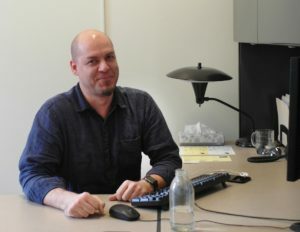 Winterthur’s Matthew Stiles takes a break from writing ‘object move’ work orders. Ultimately, I selected fifty Winterthur ceramic objects, variously made in Europe, America, or China from the early 1700s through modern times. Matthew and BRMA’s Stephen Ruszkowski and Gail Stanislow during case and block installation. Once Thomas and I had done the easy part, picking an exhibition theme, the hard work began. Do you have any idea how many people are involved in creating even a modest-sized exhibition? And as it was a loan show, we needed coordination between two separate museum staffs. 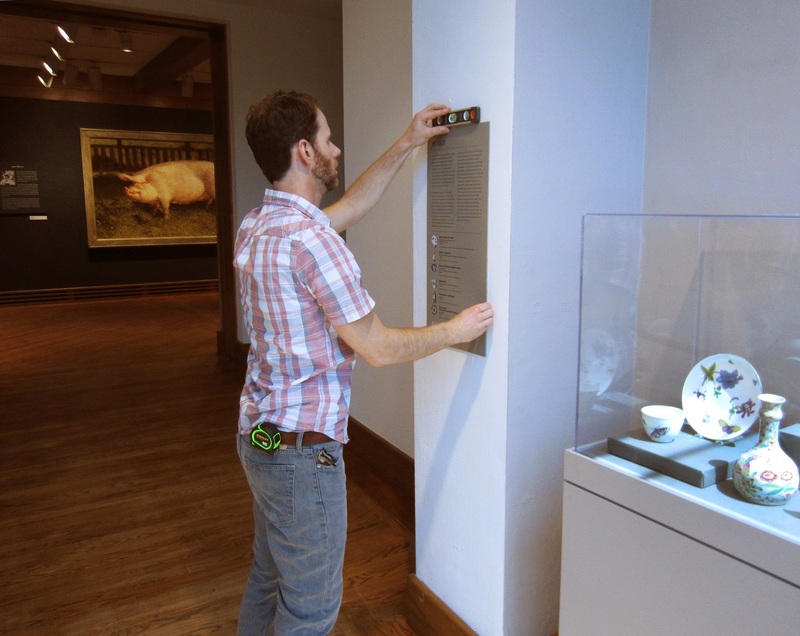 Winterthur’s Leslie Grigsby during object installation. Yes, I picked the objects and designed the show, but Winterthur registrar Katie Orr tracked all of the comings and goings of the objects as they wended their way around Winterthur (and eventually up the road to BRMA), and her colleagues completed detailed condition reports. 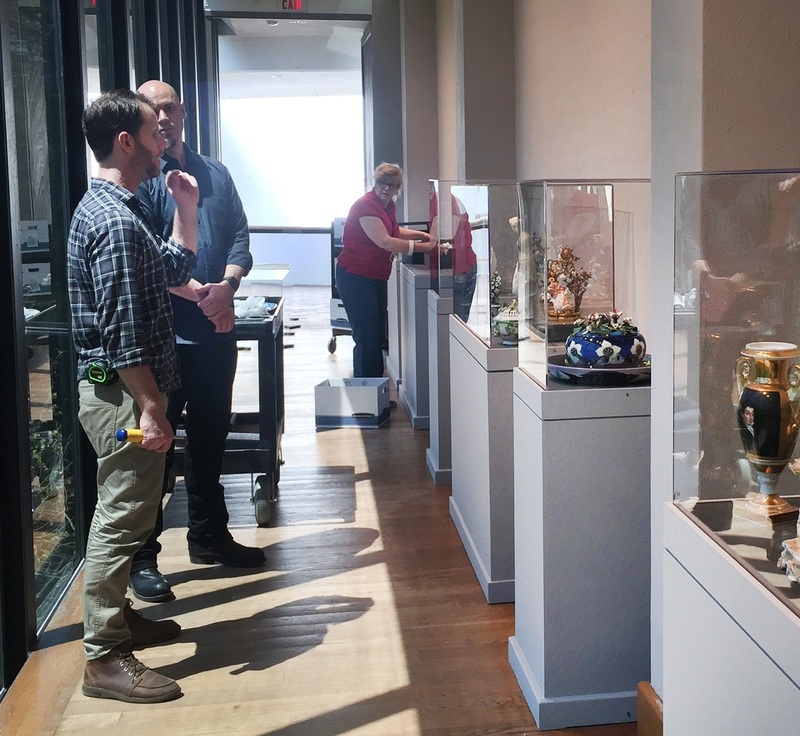 Art handlers not only gathered the objects from throughout the museum but transported those needing a conservator’s care or special mounts over to our Objects Lab, while other pieces needed to go to the photo studio. Everything was then returned to the staging area for Matthew Stiles and several helpers to carefully pack all fifty quite-fragile objects. BRMA’s Stephen Ruszkowski places the final wall panel as a friend looks on from the distance. So, was the BRMA staff sitting and twiddling their thumbs while Winterthur was a hive of activity? Nope! Exhibition Manager Bethany Engle and Preparator Stephen Ruszkowski hit the ground running, forwarding the gallery measurements to me and checking what was available in terms of cases and blocks (each eventually being individually wrapped in fabric) to support the objects. My label copy had to be edited before it was sent on to the graphic designer, and the BRMA’s registrars coordinated with ours to ensure a safe “landing” when we arrived to install the show. The result? Well, I suppose I’d be bragging if I said it all turned out pretty darned well… so instead I simply invite you to come and enjoy the exhibition yourself! An overall view of Flowery Thoughts. From Winterthur: Katie Orr, Lauren Fair, William Donnelly, Lea Lane, Matthew Stiles, Lonnie Dobbs, Betsy Keene, Laszlo Bodo, Kathan Lynch, Nat Caccamo, and Raun Townsley. From Brandywine River Museum of Art: Thomas Padon, Bethany Engel, Sara Buehler, Amanda Burdan, Stephen Ruszkowski, Donna Gormel, Amanda Shields, Gail Stanislow, Carol Ellis and Joshua Schnapf; also Darren Carcary (Resolve) and Bill Ryder (Pop Dot). 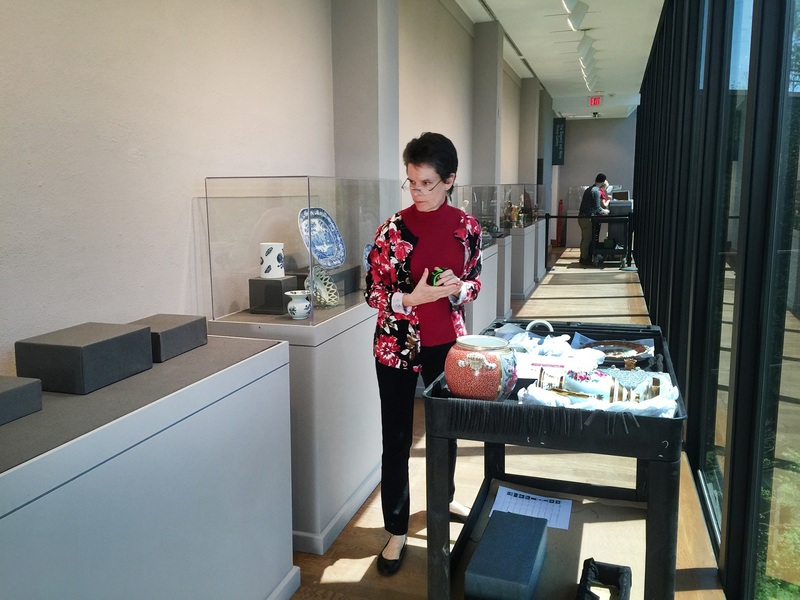 Leslie B. Grigsby is Senior Curator of Ceramics & Glass at Winterthur Museum. Click here to learn more about visiting the exhibition. For more details about current and upcoming exhibitions and programs at Winterthur, click here. This entry was posted in American Culture Studies, antiques, art collections, Art Conservation, Behind-the-Scenes, Ceramics, Conservation, Decorative Arts, Design, exhibition, Exhibitions, galleries, museum collection, Students & Alumni, Uncategorized. Bookmark the permalink.